This was most certainly not an ordinary horse. The hot blood buoyed me up like crimson liquor, making my throat warm and my body light. I had lied to the golem- it had not actually made me feel full, with just what I could take from a little girl, but that was all right. Sometimes it was better not to feed too much. If I did, I would get heavy and sluggish; now I felt sharpened, the faint hunger I had left still there to drive me. The wounds on my side were entirely healed thanks to the rest and the feast, and I thought to myself that if I met that cat now, he would get a real fight. But now was not the time to charge into the woods like a drunken fool. I reached up and touched the white ribbon around my neck. The golem took some time to return from depositing the child for me. I had been rather curious about how it would react to the sight of me taking blood, but of course the thick thing never did react much at all to anything. It merely seemed confused. I could admit a slight sense of disappointment, though of course it was better for me if it did not disapprove of my means of nourishment. I had climbed to one of the lower oak branches and was sitting there, swinging my legs, by the time the golem came stumping back through the meadow. It gained a kind of sheen to its damp skin in the moonlight. I ran my tongue across my teeth. “Yes,” said the golem, which had stopped moving, and now stood perfectly still while it looked up at me. I suppose I did make a sight, sitting up there naked with the scratchy bark irritating my arse, but I had never seen the point to modesty. I rubbed my chin, frowning. I hadn’t heard any bells either, and I ought to have, with the village so close. “It was very loud,” said the golem. The golem didn’t say anything. I hopped down from the branch and dusted myself off. The golem inclined its head and reached towards its belly. The golem took a long pause, as though it were working something out for itself. The golem turned its head down to look at its hands, and made a very slow imitation of my gesture, placing its big fist delicately in its palm. I hesitated, then decided to take a calculated risk: I would tell the truth. I took a pause and waited for the golem to take all this in. It was probably a lot for the poor thing to absorb. “Why did you let out her horsemen?” it asked, after a little while. That was an understatement. A very large understatement. The golem put its fist against its palm again, faster this time, so that there was a smacking noise of clay on clay. “Mother is a witch,” it said. The golem touched its shoulder and did not say anything. I rubbed the side of my neck. “I do not know the way,” said the golem. It might have been just me, but I thought its tone sounded rather pensive. I glanced up at the moon, which was a shining half in the night sky, scratched the back of my calf with one foot, and then became a red fox. “Oh,” said the golem, sounding surprised, and I let my fluffy tail hang in a smug arch before giving an authoritative yap. I led the golem through the meadow, just parallel to the river, leaping and cavorting and enjoying my fox form. I still had that edge of hunger, and in the predator’s shape I felt it keenly as something caught between playfulness and bloodlust. My sharp little teeth wanted to bite into something and hear it crack. It might have been wiser to rest a little longer, to let the drunken feeling subside, but I was a young strigoi, and I took a great deal of pleasure in it. I darted through the tall grasses, my sharp nose twitching, alert for the sharp tang of blood, of tiny beating hearts. Only the golem’s steady progress behind me managed to keep my mind loosely on task, which was something of a blessing. This blood-drunkenness was what had got me in trouble with the first witch. Finally we came to a wide curve in the river, where it swung eastward, and I sensed that we had come to a new territory. The first horseman wandered here. I knew because I had tracked him down, and had him witness my failed attempts at recapture. He had laughed quite a bit. Well; we would see how he liked my golem. I stopped, twitching my glorious tail, and looked back over my shoulder. It was stumping rather quickly over towards me. “There is something watching us from the trees,” said the golem, once it had caught up. I pricked my ears and looked at the branches above our heads. The wind had picked up, and they were beginning to sway, the leaves whispering together. Wisps of cloud were flying across the night sky, obscuring the stars, and making the moonlight fall unevenly across the trees. There was a pair of red eyes looking at us from above. As soon as I noticed them, they snapped off again. I raised my tail slightly and glanced back at the golem. “What is it?” it asked me. I could not answer as a fox, so I ignored it, just stalked forward more slowly, licking my lips. I had a good idea of what those eyes belonged to. We entered the forest. But it was different from before. It was no longer quite so lush, and the trees were skinnier, stunted, sometimes growing in odd directions. The bark was grey or black. The wind was cut off as the trees closed in, so that we were left in a weird kind of silence, without even insect noise to comfort us. It was the sort of atmosphere that made one cautious, and I could rapidly feel myself sobering up as I grew slightly nervous. The golem, too, seemed wary, for its footfalls had grown much lighter, and it kept close to me. We moved slightly downhill, and came to a narrow, rocky glen where white mist pooled low around the tree trunks. I stopped, and so did the golem, because we saw those red eyes again. Their owner stepped out of the mist and into a patch of moonlight. It was a Blajini with the head of a white rat. It looked at me and the golem, and then gave a very long, derisive chitter. I had spent some time learning to decipher Blajini-talk, mostly because they are great gossips, but there is an important thing to remember when listening to a Blajini: they have all the manners of a spoiled child. What this Blajini had said to me was, Ugly stone man and fleabitten fox! What witch do you serve? The nice thing about Blajini is that they are adept at understanding the language of beasts, so I did not have to show this one my natural form to converse with him. Is it your business? I asked, letting my canines show. Is it anyone’s business? My business! Her business! That stone man smells like Mother Forest! She breaks the rules if she sends stone men and strigoi across the border! Muma Balaur will tear out her liver and feed it to the wolves! Fool, I said, thinking quickly. I had not heard the name ‘Mother Forest’ before, but it had to be the witch that had made the golem. We do not belong to her! You smell it because we have just walked through her territory. We belong to no witch! The Blajini blinked its large red eyes, glancing between me and the poor golem, which likely had not caught a single word of our conversation. It was standing motionlessly behind me. Maybe you tell the truth, maybe not Mother Forest. But there is a witch! You bear a witch’s token! It raised a shriveled little finger and pointed to my neck. The Blajini rubbed its hands over its long nose and gave a chittering laugh. You are enslaved by this witch! It is a death-curse! In a flash I sprang free from my fox form and grabbed the Blajini by its little neck, so that it choked and clawed at my hand. “Don’t forget what kind of thing you are speaking to,” I hissed, digging in my fingernails. I glanced behind myself, then let the Blajini go. It staggered backward, squeaking pitifully. “You are not,” said the Blajini. The Blajini thrust its whiskers outwards, its nose twitching madly. A single drop of red blood had welled up where I’d bitten my finger. The Blajini’s mouth opened slightly at the sight, and it dropped to its knees before me. I raised my hand above its head and let the blood drip down onto its fat tongue. The greedy thing swallowed it at once. “I am very forgetful,” it said, blinking, all a-quiver. At once the Blajini scampered off, scrambling through the mist, waving its arms like a child. The golem slowly turned its head to watch it go. “That was a pain,” I said, and sucked on my finger. The golem slapped its fist into its palm. “Yes, Gabi,” said the golem, in a way that I thought was suspiciously meek. I became a fox once more and led the golem through the glen, darting from rock to rock, making the mist swirl. The moonlight faded away, leaving us with cloudy starlight, but that was enough for me. I leapt to a particularly large rock, covered in lichen, and changed back, so that I crouched naked on all fours. When the golem did not reply, I looked back over my shoulder. It crouching to examine a large and hideous black toad that was sitting at the bottom of the glen. “Kezia,” I snapped. The golem looked up rather quickly, and the toad laboriously hopped away. “I wondered if she needed a place to stay,” it explained. The golem inclined its head. I changed back into a fox, and leapt lightly down from the rock and onto the golem’s broad shoulder, putting my paws on top of its round head. I had intended to merely use it as a vantage point to get a better whiff of the horseman, but the golem seemed to mistake my intent; it started moving with a lurch. I was not prepared, and had to dig my claws into the clay to stop myself from falling, my tail whirring behind me. The golem kept marching down the center of the glen, oblivious. Well, having a ride was not bad. I licked my nose once I had settled myself, and then turned it into the breeze. The scent of the horseman was getting stronger, as the ground sloped more and more downwards. It was no ordinary scent- like spice, like falling leaves, like the last pop of a dying fire; bright blood, shiny copper, or a fat orange cat; orange peel, shiny polished mahogany, and human sweat- it was all that. It was the smell of twilight. We came out of a glen and into a starry meadow, and saw the horseman. There were many clouds, but they were thin and wispy, and they did not block out too many of the stars. When we came out of the trees and into the clearing, I saw them all, and there were so many more than I remembered. And the sky was not just blue, but bands of different blues, and the stars hung there like they were suspended in a gossamer shawl. I was distracted by the stars, so I did not notice the horseman until I felt Gabi go stiff on my shoulders. Her thick tail swished against my back. I looked away from the stars, back to a much duller earth. The clearing was covered in short grass, and for the first time since we had entered this part of the forest I could hear a few crickets chirping. In the center of the meadow was a horse standing with its head down. It was so still that I thought it might be asleep, but then I saw it give its long tail a swish. “He hasn’t noticed us,” whispered Gabi, right by my face. I was startled. She had changed back, and had her arms wrapped around my neck so that her head was next to mine. I could feel her bare feet digging into my back. “Where is the horseman?” I whispered. To be honest, this had confused me, because it did not make much sense. But then again I did not know very much about witches. “If he spots us, he’s going to run away, so we’d best be quick,” said Gabi, and leapt lightly down from my back. I turned my head and saw her crouching down in the grass beside me. It was a good threat. I began to move, glad for my new legs, though they were still thick and clumsy. I made a little noise. The horse whisked its tail again, but did not look up. I wondered if there was something wrong with it. It smelled strange. When I was only a few feet away from it, the horse began to move as well. It walked slowly though the grass, making a snuffling sound with its nose. I hurried to catch up with it, and it walked a little faster, until it was nearly trotting. I moved a little bit faster, still trying to be quiet, and the horse turned an ear and then glanced back at me. It was a very quick glance, but there was something about it that made me think that the horse was enjoying itself. I was more worried about losing it than having fun, though. I stopped in my tracks, and the horse stopped too, and looked back at me. I did something I had never done before then: I leapt. Forward, to be precise, and the horse reared up with a surprised whinny as I grabbed it around the middle. I was expecting it to feel warm and furry, but the thing wrapped in my arms was nothing like that. It screamed. It screamed like I had never heard before, and the sound rang inside my hollow body. It was hot, too hot, and it almost felt like liquid- burning, writhing liquid in my arms. I think it was at around that point that it began to glow, and its mane lit on fire. With a little shriek a bat dropped down out of the sky and became Gabi, who was looking very triumphant. She grabbed the ribbon around her neck as the horse screamed and struggled, kicking out with its hooves with a sound like bells ringing. I was hoping that she would get the ribbon tied onto it quickly. Not that I was losing my grip. I had never lost my grip on anything before. But the horse was just very uncomfortable to hold on to. It did not feel right, and the flames were making my skin dry and crack where they touched it. But Gabi seemed like she was having trouble getting the ribbon off of her neck. She tugged and tugged, but it would not come free. “Gabi, you are scratching yourself,” I said. Her fingernails were carving red furrows into her skin as she clawed at the ribbon. I think at that moment Gabi and I were equally startled, and neither one of us said anything. The horse shook its head, and the flames on its mane began to die down. “Stupid,” it added, and Gabi seemed to snap back into place. “Out of order?” Gabi repeated, in a very thin way. If I had been that horse, I would have stopped talking, but he kept on going. “Kezia, would you mind breaking a few of his bones?” said Gabi. “Why? So you can run away before we catch the others?” Gabi snorted. “Oh, yes, I’m sure towing me around is going to make that a lot easier,” the horse said, sticking his rubbery lips out. Gabi scowled, which I was beginning to learn was a sign that someone had made a good point. “Perhaps if we build a cage of some sort,” she started. “Please, do that,” added the horse. “I think that if we made it out of wood, he would set it on fire,” I felt compelled to say. Gabi shot me a look. “You’re serving her?” asked Gabi, furrowing her brow. “You may be right, but what can you really do about that?” countered the horse. Gabi’s eyes got very thin, and she muttered something that sounded impolite under her breath. “Let the stupid nag go, Kezia,” she told me, turning her back to us. “Sore loser,” the horse muttered, and I gave him an extra little squeeze before releasing him. At once he sprang away, his glow fading entirely, until he looked just like an ordinary reddish horse again. “Will you?” said Gabi. I did not think she seemed very pleased that the horse was still around. I saw one of Gabi’s fists clench. “Underground…” Gabi’s eyes had got exceptionally narrow, and her fingers were tap-tapping on her thigh. He tossed his head and snorted, then trotted off between the trees. Gabi stopped tapping long enough to glare after him. “Next time you’re going to have to break some bones, Kezia,” she said. As she had predicted, Gabi was indeed very cross. She stalked through the woods in her human form, her eyes thin and her jaw set. I had to quicken my pace a great deal to keep up with her. I could tell that we were moving back towards my old home. I was actually feeling a little bit happy. Of course I could not let Gabi know this, as it would not improve her mood, but it was the first time we had walked side by side together. I was not sure why it made me feel happy, but it did, enough to chance a question. Gabi made a growling noise in her throat. Still no answer. She really was cross. But maybe she also felt bad. The horseman had not spoken kindly to her. I think I would have felt bad if he had talked that way to me. At this Gabi stopped, and turned on her heel to face me. In the moonlight her face looked furious. I checked myself from contradicting her. She looked as if she was warming herself up to say something more. “For what?” I asked. I wondered if she did not like being around me. That did not feel so good. “How long do you have left?” I asked. Now I stopped feeling bad because of her words. I could see that she was very frightened. I glanced up. The moon was half-full now. But it did not sound like she knew whether it had been waxing or waning. It could be a day or a few weeks before her time was up. Gabi blinked at me several times, stock still, and then yanked her hand away. I noticed that her cheeks were slightly flushed. “Of course we should hurry,” she said, and turned her back to me and kept marching forward. When the sky started getting pale, Gabi instructed me to keep walking until I was close to the border of Mother’s territory. “I’ll slap a plan together after sunset,” she growled, and then changed into a bat and crawled through my eye to sleep. She needed a lot of sleep, it seemed. I hoped she would feel better after she woke up. She had not gotten out of her bad mood the whole time we were walking back through the woods. I was back to being worried about her again. Now I very much wanted to help her catch the horsemen, because I would be very distressed if her head came off. I touched my own neck as I thought about it. I was not sure what would happen to me if my own head came off. Would I die? Or was dying like sleep, something that golems could not do? I had not thought about it before, and it felt very uncomfortable. Not that I wanted to die. That seemed like a permanent sleep, like being still in the house under my mother’s orders forever and ever. But I also was not sure if something could be called alive if it did not have a death. Was I alive? I decided to stop thinking about myself so much. It made me have kind of an itching feeling inside my hollow head, like someone was scratching and whispering to me indistinctly. It was not Gabi, because I could hear her little bat snores coming from my shoulder. I looked around at the skinny trees instead as I stumped forward. Muma Balaur’s forest was not nearly as pretty as Mother’s. Although the fact that the trees were farther apart and smaller made it easier for me to move my big body through them. Still, I liked Mother’s forest better. Her forest had so many different smells and sounds and sights. This forest’s trees all looked the same, and all it smelled of was rotten leaves and woodsmoke. A soft chitter made me turn my head upwards, and to my delight I saw two bats swooping down towards me. My bats! I thought I had to have lost them by walking so far during the night. The other bat landed, and they each crawled through one eye hole. When they got inside, I heard more chittering. I think it was because they noticed Gabi sleeping there. “I hope you do not mind sharing,” I said. The bats did not answer, of course, but I felt them settle in under my opposite shoulder. Having all three of them safely tucked away made me feel very warm. It was nice to have company even if it spent most of its time sleeping. I started to take a step forward again, and then stopped. There was someone staring at me through the trees. It was a man. Or maybe a boy. Maybe in between. He was wearing pants but no shirt, and chewing on a stalk of something while he leaned against a tree. I stared at him motionlessly. My first thought was that I was not sure if Gabi would want me to talk to him. Then I got worried because I would have to decide whether or not to talk to him myself, with my free will. I did not feel ready for such a task. Then I realized that he had said that he had met me before. But I did not remember that. The boy spat out whatever he was chewing and scratched the back of his head. His hair was short and dark brown, a little darker than his skin, and he had another line of hair going down his chest and under the waistband of his pants. His feet were bare, and he wriggled them in the dead leaves as I looked down at them. I was still confused, and would have stayed that way except that I suddenly caught a peculiar scent coming off the boy, like crisp apples and moldy parchment and fresh meat. “Are you the red horseman?” I asked. He seemed pleased that I had guessed, for he nodded his head very vigorously. As his hair flapped on his head I noticed that it continued down his back like a mane. This made him laugh. It was a surprisingly jolly laugh, and it sounded a little older than he looked. “I do not think she would,” I said, but quietly, feeling a prickle inside my chest. Pascha gave me a sidelong glance, and then linked his hands behind his head, his skinny elbows sticking out. For a moment Pascha just looked at me with both eyebrows raised, and then he put down his hands. I did not know what to make of that, so I stayed quiet. His eyes slid downwards and he reached out and brushed my side. The skin there was still dry and cracked from when I had held his flaming mane the night before. “Oh, good,” said Pascha. His eyes flicked back up to mine. I noticed that they were brown, but a very bright, coppery brown. “Where is the blood-drinker?” said Pascha, in a tone so innocent it made me wary. “Somewhere very safe,” I said, and he laughed. Baiting the witch had been an unusually foolish move for me. I was not the kind of person who took risks. Even though I was a strigoi- the sort of creature that would no longer have to fear such trite things as old age, or disease, or any sort of non-fatal wound- even for all that, I was cautious. Strigoi are not nearly as powerful as they seem. The normal way of the strigoi is to hover near their site of death, build a lair for themselves, and then lure victims to it. With a steady supply, a strigoi can grow in strength and cunning over hundreds of years. But the reality of the matter is that humans are not so stupid as we strigoi want to think, and they do get wise after a while. Sooner or later that strigoi is going to face an angry mob that puts a stake twixt his hearts. I did not stay near the place where I died. Before I was even really conscious of what I had become, I pushed my way out of the earth and moved away, far away. It suits me better to be a transient, taking blood here and there but never staying in one place long enough to be in danger. It made me weaker, more prone to hunger. But I was safe, and more importantly, unshackled. Witches and strigoi do not usually have much to do with one another. Strigoi do not make good servants, which is the only reason witches would be interested in us; conversely, the solitary strigoi have little use for the earthy magic that witches employ. So I found myself unmolested, for the most part, when I crossed through the territories of different witches. Perhaps it made me too confident. I had caught a man in the forest, a middle-aged man with a lined face and large hands. He’d been calling out someone’s name, carrying a lantern. He’d seemed quite surprised when I had jumped down onto his back and dug my teeth into the side of his neck. The lantern’s light had long since died by the time I raised my head, chin-dripping with blood. I had made a complete meal of him. People disappeared in the forest all the time, so there was no need for me to be stingy. I was hot and flushed with blood, drowsy but not really tired, swaying over top of the corpse. And then I heard a noise. A stick cracking, leaves rustling; someone was coming. In a flash, I saw it all: the man, looking for someone, calling out, and this beautiful young woman, placing a lily-white hand against the trunk of a tree, face pinched and frightened. She did not see me in the dark, but I stared at her, still swaying, still suffused with blood. More, was what I thought. Her. She began to walk away, and I followed slowly, naked and bloody, fingers curling, eyes fixed on the back of her neck. She was a tall, and well-featured, this young woman. Perhaps she would put up more of a fight than her father had. Perhaps I would let her. I gazed at her dark hair, transfixed. In my drunkenness I did not realize which way the young woman was heading until it was nearly too late. She had stepped onto a path, little more than a balding deer trail winding between the trees, spotted with mushrooms on either side. An aged, raspy voice answered her. It was such an obvious statement that I wanted to snigger. Luckily, I was a rabbit, so I only wiggled my lower jaw from side to side. “My sympathies,” said the witch. I thought rather critically that she needed more oil on that creaking voice if she was trying to be convincing. The witch chuckled. It was not a pleasant sound. Her pointy shoes began to shuffle off. The woman took a step forward. “I hope so, my child,” said the witch. The dark-haired woman turned, and I gazed up at her with my big rabbit eyes. Lost to the witch, but not to me. I had no need to lure or trick anybody. As the woman stepped off the witch’s path, I became a wolf. Sleek and red, I followed her, stepping where she stepped, my sharp ears focused on the beat in her throat. Life, life, life, it called, and oh, I listened. I could see why the witch had wanted her. They like people with potential, witches do. They like trapping it and twisting it to their own ends. I just liked to end it. The woman stumbled over something that clinked. She squatted down, feeling with her hands, her hair sliding away from the back of her neck. I tensed. “Oh!” said the woman- she had discovered the shattered lantern, her fingers running over the broken glass. The smell of blood was suddenly thick in the air. I wanted it, but I could not move. In front of the girl, where she crouched in the dark, sightless, was her father’s body, and behind that, the witch. The young woman must have seen her as an elderly grandmother, ravaged by time but harmless; I saw her as she truly was. An old woman, yes, but more than that- a concentration, she was, of a thousand invisible twisted threads, all running through the trees around us, like the web of a giant spider. And like a spider, I knew that this witch could sense the slightest disturbance along any of these threads, and scuttle after it to inject it with venom. She was gazing straight at me now, in my wolf-form, and her eyes were black and terrible. The woman between us still crouched and felt through the leaves, oblivious to everything, oblivious that now her fate could turn to one evil or the other. The witch stared at me, unblinking, and though I tried I could not match it, and turned my lupine head away, and was suddenly a rabbit again. The witch vanished, and the woman rose up. I did not stay to witness their reunion; I scampered, fleeing through the darkness as fast as my legs would carry me, fleeing from the presence of that witch. I was frightened, but I was angry, too. Humiliated. Well, I was still drunk then. Teach me to tangle with witches, I thought hazily to myself in the present, hanging upside-down in the golem’s shoulder. Especially ones so powerful as that one. I had not realized just who she was, and I had been made to pay for it. I suspect that pride more than anything is what most often cuts the immortality of a strigoi very short. I was stuck in a kind of drowsy half-sleep, reminiscing gloomily- how could I expect to sneak back into Mother Forest’s territory? when I noticed how alarmingly hot it was getting inside the golem. The other bats across from me had woken up as well, and were fluttering their wings in panic. I shook myself, blinking, and noticed that there was smoke stinging my tiny eyes. The other bats were crawling up towards the golem’s mouth to escape. Now thoroughly awake, I began to crawl upwards, coughing as the smoke increased. Then there was a tremendous thudding sound, and the walls shuddered, and up briefly became down as the golem rolled. I lost my grip and was battered from side to side in the golem’s throat, chittering and flapping. Somebody was talking from outside the golem- perhaps more than one person- and it was beginning to get hot again. I flapped clumsily and got myself to the top of the golem’s skull before it could jerk me around again. What was it doing? “Do not come out, Gabi,” came the golem’s voice, floating up from the darkness below me. It sounded rather urgent. At once I crawled out through the eyehole in front of me and saw nothing but a bright mass of flame and teeth. I let myself drop to the ground with a splash, changed back, and jumped up panting. 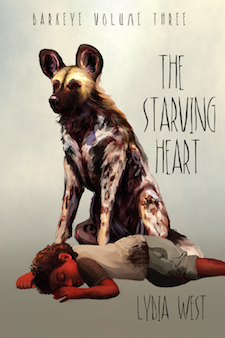 « Darkeye Volume Three: THE STARVING HEART now available! Gabi doesn’t take direction well. But I’m with her on this – what is going on? must have more! “But will let it escape this forest for a little while.” but it will? “chin-dripping with blood.” why the hypen?